juniper berries grabbed me and held on tight. I love the different botanicals in different gins. When I discovered sloe gin I was blown away. In my younger days I mixed my gin with lemonade or lemon squash. Now I shudder at the thought. Being older and wiser I go for the more traditional gin and tonic with a slice of lemon, lime or cucumber. A while ago I saw that The Bass and Flinders Distillery in Melbourne’s Mornington Peninsula was offering a Gin Masterclass. I couldn’t wait to enrol in their two hour workshop and quickly booked a place. I wasn’t sure what to expect when I arrived and was a little nervous. All I knew was that it was a workshop where I would be creating a bottle of gin for myself! I shouldn’t have worried. As soon I walked in the door, I was offered a gin and tonic with a choice of gin. That’s a good start! They make a few different gins here so there was quite a choice. I chose the Monsoon, which is a blend of 8 botanicals featuring coriander, ginger and lemon grass. It was delicious. 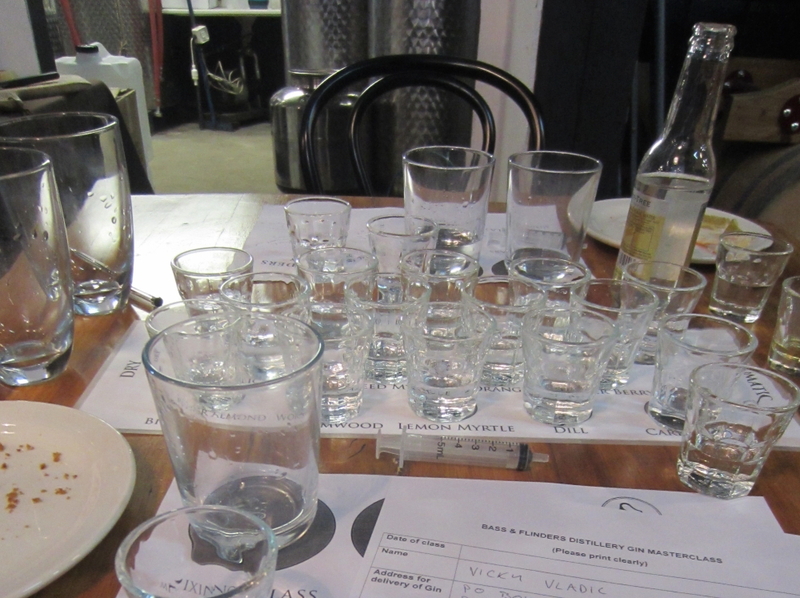 I sat down at a little table and was confronted with an array of small glasses filled with liquid alcoholic botanicals. It was like being in a laboratory. I had a mixing glass in which I poured the juniper berry base. Coriander was added as the balancing element. Now all I had to do was decide which other flavours I wanted for my personal blend of gin! The botanicals came from three regions – Asia, Australia and Europe and ranged from dry to aromatic. I decided to try and taste all the botanicals but after a few sips I was getting confused. So I just launched in and starting mixing flavours – keeping written notes so I could remember my final blend. I was doing really well until I added lemon myrtle, one of my favourite Australian herbs. Sadly it completely destroyed my gin and turned it into a lemon cough syrup. No amount of coriander could balance out that taste and I was devastated. Luckily there was a second round. I decided to punish and banish all the Australian botanicals from the next round and went for a blend I like to think of as The European Panda 🙂 There were only a few European botanicals so I decided to use them all and mixed them with a few Asian botanicals to come up with a very delicious gin. My final concoction was a heady blend of juniper, coriander, barberry, dill, elderberry and cardamon. My job was done! All I had to do was decide what I wanted on my label and then wait for my very personal bottle of gin to arrive in the mail. The first part was easy as I’d already made up my mind. The second part, not so much. Patience is not my strong point. As the weeks passed I kept checking the mail, getting more and more anxious. Would the gin be as good as I remembered? How long was the process going to take? Had they forgotten me? Where is MY GIN?? were just some of the thoughts that ran through my mind. Finally my package arrived. I cracked it open and took a much anticipated drink. It was better than I remembered. It was so good straight that it didn’t need any mixers. Another one of my favourite drinks growing up was Brandy Alexander. It wasn’t the brandy I liked, but the cream and the chocolate. Naturally I had to try it with gin. Place all the ingredients in a cocktail shaker with ice and shake well. Stunning looking bottle and as for the Gin Alexander well I can’t think of anything better to say than sounds bloody marvellous absolutely love it. I was rapt with the bottle – it looked better than I thought it would. The “pagan” looking ladies are so me.